The ability to dress ourselves in the morning is something most of us take for granted. For people coping with multiple sclerosis, arthritis, amputations, and other physical impairments, however, wrangling a series of zippers, buttons, and snaps can be a trying experience. With Xeni, Ann Oliver, a former architect with MS, has designed a line of clothing that addresses some of the shortfalls of conventional garments. 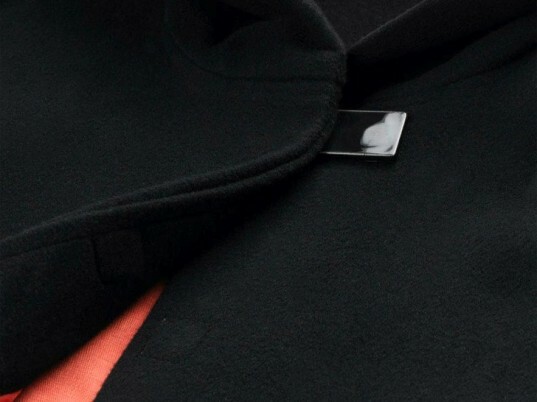 Magnets are used as self-propelled fastenings in coats and jackets, for instance, to help women who have trouble manipulating standard closures. Unlike existing adaptive clothing, it also considers the aesthetics of each piece. Oliver’s MS diagnosis in 1990 soon made it impossible for her to stay at her London practice. Besides requiring a wheelchair to get around, she also lost mobility in her hands. “I now find catches on jewelry, as well as buttons and zips on clothing a problem to manipulate,” she writes on her website. Oliver recognized that her problem wasn’t unique. “Many other people in the world are in the same position,” she says, “and many as they age will confront the same problems. Oliver has designed tunics and trousers that elongate the seated figure while considering prosthetic limbs and medical accoutrements. After taking a course at Central Saint Martins in 2010, Oliver began work on her label, which she now manufactures in London using experienced tailors. In addition to magnetic fastenings, Xeni offers dresses, tunics, jackets, and coats with detachable seats for women in wheelchairs to put on without assistance. Oliver also designed tunics and trousers that elongate the body of the seated figure while accommodating prosthetic limbs and medical accoutrements. For older women or those with wider girths, her pieces also draw attention away from the arms to the head, neck, and shoulders. In the future, Oliver plans to create bags that stay on the lap and allow easy access to its contents, particularly items like cellphones and keys. “I want to engage with my customers to design fashionable garments that provide solutions for as yet unrecognized requirements,” she says. Do you have a contact email address for Ann Oliver as iwould like to get in touch regarding a new charity called Beauty Unseen. Many thanks.